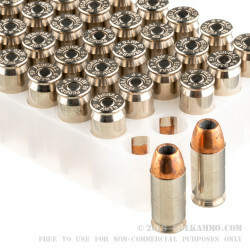 These +P rounds from Federal offer fans of the .45 ACP a stout self-defense round which is street-proven by law enforcement records. 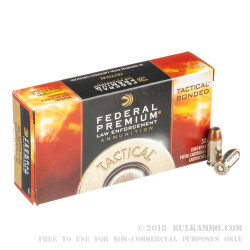 Federal's Bonded HST projectile design is a hollow-point with a steep ogive for smooth feeding and wide-mouth cavity with skiving that blends the edge of the copper coating with the lead core. The copper jacket is permanently bound to the its lead core which results in a round that will penetrate past intermediate barriers with minimal deflection for accurate hits on target. Upon impact with a target, the projectile will expand to almost double its original diameter without shedding or fragmenting and will create a large, free-bleeding wound for rapid incapacitation with reduced risk of over-penetration. With a 230 grain weight, these projectiles match the most common practice loads for consistent relationship between aim and impact. 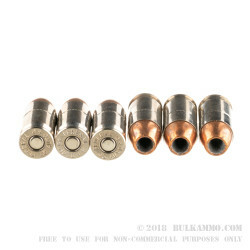 Each cartridge utilizes a clean-igniting Boxer primer fitted to a reloadable brass casing which is nickel-coated for corrosion resistance and dependable cycling. The case also has a mid-body crimp which prevents setback in order to preserve safe, reliable function. 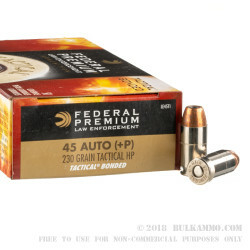 Federal's law enforcement lines and HST ammunition are high-demand products which have earned high favor with the FBI as well as several police departments at all levels.